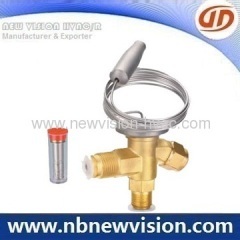 We're a professional manufacturer and supplier in thermostatic expansion valve in competitive prices and top quality, which is mainly used for the cooling system. Welcome any enquiry from home and abroad customers. Thermostatic expansion valve regulate the flow rate of refrigerant intoevaporators according to its degree of superheat. Both the internal equalizerand external equalizer systems are furnished, especially, the external equalizertype efficiently eliminates the influence resulted from the loss evaporatorpressure. Remark: Nominal refrigerating capacity is based on the condensing temperature32°C, evaporating temperature 5°C. In case of more assistance about refrigeration expansion valve, welcome to let us know any time and the reply will be made in 24 hours.